Contractors must meet our standards. To better serve our customers, Tile & Stone Works helps you locate only those flooring installation contractors who meet our high standards of workmanship and dependability. That’s why we created our online listing of qualified contractors – to help our retail customers identify and contact flooring installation contractors who we believe perform work in a highly satisfactory manner (as determined by feedback from our customers and other factors). We work with independent contractors. Please keep in mind, Tile & Stone Works is completely independent of these contractors. Although they must meet our strict expectations, we make no representation or warranty claims, express or implied, with respect to the services to be rendered by any tile installation contractor. This includes, without limitation, any implied warranty of merchantability or fitness for a particular purpose. 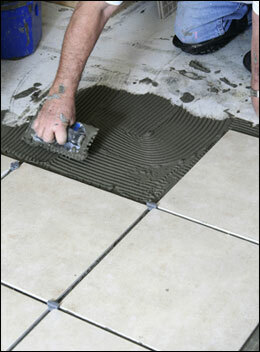 While we make every attempt to bring to you qualified, dependable tile installation contractors so that your experience with Tile & Stone Works is a truly positive one, in no event shall Tile & Stone Works be liable for any direct, indirect, consequential, incidental or special damages arising from your dealings with such contractors. Majestic Tile & Marble, Inc.